If you really, really need to get a message across to a visitor, then one solution may be a splash page, or a kind of pop-up that is present from the moment someone lands on your site. Yes, they can possibly be annoying to some, but they are also effective – this is why you see them so often. The WP Splash Image plugin could be your answer. It’s a relatively simple splash plugin that still gives you a number of nice options. 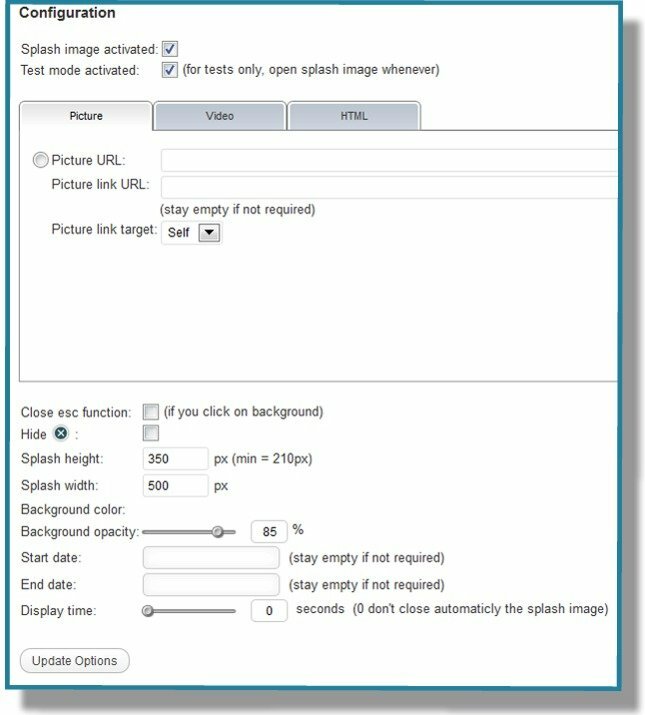 The WP Splash Image plugin allows you to display images, videos, or html code as your splash page. You can also set the plugin to start and end on chosen dates, set it to automatically disappear after a certain number of seconds, or you can let it remain until the user either clicks on it to go to your chosen page, or they or exit out of it by clicking on the X in the corner or on the webpage behind it. You can take a look at some of the settings here. You can also choose from a number of video sites to display a video as the splash. The video sites include YouTube, Yahoo, Dailymotion, Metacafe, or any URL for a flash video. The difference from the splash effect that this plugin offers and a pop-up is that the image or the video never actually “pops up.” It is present from the beginning. It may be a small difference, but personally, I find that less annoying. It seems to me that popping up on a visitor can be like sneaking up on them from behind, and therefore more annoying. There are more sophisticated splash solutions out there, but there’s a good chance you will need to pay for them. So if you looking to test out some splash effects, or you don’t need something overly sophisticated, then this plugin might be just what you’re looking for. You can download the WP Splash Image plugin here.